Were any British Ensigns in use in South Africa before 1910? What were the flags of the Cape Colony and Natal? Did the Boer states retain their "native" flags under British control? Yes - SAVA published a Journal entitled "The Union Jack over Southern and Central Africa, 1795 - 1994" [brl94] in 1994 which covers all these flags (and those used in what is now Zimbabwe, Lesotho, Botswana, Malawi etc). The Southern African Vexillological Association Journal (SAVA) SJ: 3/94, 'The Union Jack Over Southern and Central Africa 1795 - 1994' by F.G.Brownell, [brl94] and 'Sovereign Flags of Southern Africa' by A.P.Burgers [bur97]. 1. Was the first badge used on the Red Ensign? Both books have illustrations of the ensign, but the text, page 25 in the Journal, reads, "A physical example of this Red Ensign is in the Killie Campbell Museum in Durban." According to an illustration in C. Pama's 'Lions and Virgins' [pam65] the flag in the museum has a variation of the badge, in which the royal arms have no supporters and the wildebeest are running in the opposite direction. I am sure that there was no official Natal Red Ensign, but am quite prepared to believe that there might have been unofficial ensigns that used the official badge, if there is any evidence. 2. When did the second badge replace the first badge? The books have 1875, but I am certain that the correct date is 1905. On page 26 of the SAVA Journal is written: "In line with the Colonial Office dictum of 23 August 1875, the device on the fly of the Natal Blue Ensign was simplified as illustrated below." This does not agree with the reply to that letter. The original badge was in colour and the simplification was to change it from multi-colour to monochrome, not from one design to another. "16 February 1876. Government House, Maritzburg, Natal to Colonial Office. I laid your Lordship's Circular Despatch of 23rd August last before the Executive Council, and with reference to the second paragraph of the despatch I have the honour to state that the drawing of the Device of the Colony of Natal was considered sufficiently correct, but the multiple colouring of it was not approved, and the Colonial Engineer was instructed to prepare a Device which should be of plain uniform colour (maroon recommended) on a white ground. This has been done, and I enclose a coloured drawing in duplicate of the badge, which I only received a few days ago, and which I trust may not arrive too late for the purpose for which it is intended. The colour drawing, which had no garland around the badge, was passed on to the Admiralty. "12 April 1876. Colonial Office to Admiralty. I am directed by the Earl of Carnarvon to transmit to you, to be laid before the Lords Commissioners of the Admiralty, a copy of a dispatch from the Lieutenant-Governor of Natal, enclosing a revised drawing of the Device to be borne on the flag to be flown by the Governor of that colony. 2. If their Lordships approve of the proposed change of colour for the badge, I am to request to be furnished with six copies of the drawing as it will appear in the Admiralty Flag book, for transmission to the colony and for the record in this Department." The second badge is in the Colonial Office Record Book [CO 325/54] with a note; "1904. Admiralty presume direct on Blue Ensign, but on a white disc in the Union Flag". It was inserted into 1889 Admiralty Flag Book by amendment dated 31 May 1905. The flag as depicted in 'Lions and Virgins' has the Wildebeests running toward heraldic Dexter i.e the other way from the ones in the first badge and in the Journal. Page 55 of 'Lions and Virgins' states: On the devise which came into being in 1870 the wildebeests are running from left to right, *except* on a flag in possession of the Killie Campbell library of Durban (also illustrated in R. Gerard: 'Flags over South Africa' p.38 [ger52]). This is a *Red Ensign* with the Natal emblem on the fly. This emblem shows the usual picture of the two wildebeest, but this time running from right to left and topped by a different version of Queen Victoria's arms, namely the Royal shield only, surrounded by the legend of the Order of the Garter and topped with a Royal crown but without the supporting lion and unicorn. It is obvious that this inset must have been taken from the colonial seal, there is no other possibility, but no other example of it has come to light. In other words, this is (was), as I read it, the one sample known of a Natal Red Ensign. Therefore the Red Ensign on p. 25 of the SAVA Journal and the first badge, which is based on the depiction in the Journal has the badge that is based on the Blue Ensign. 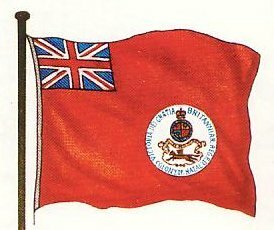 I am sure that there was no official Natal Red Ensign, but am quite prepared to believe that there might have been unofficial ensigns that used the official badge, if there is any evidence. Red Ensigns may have been very scarce at the time, but in the mid 1990's they were in plentiful supply at all the Durban tourist shops. I can't remember which version was being sold though, but I think it was the version from the Journal as its manufacturer was a member of SAVA (The Miss Killie Campbell's Red Ensign: see below). My business partner local artist Ted Brandon and I, were responsible for researching and reviving the Natal Red Ensign in the mid-1980s. Natal had always had a strong British connection and was considered a renegade Province by the rest of the country at that time. Ted designed the famous bumper sticker which had the fly half of the Union Jack on the right and the 1875 Captain Hine version of the Natal Arms on the left. The Sticker was red with the legend "Natal - the last outpost." The design was derived from the Natal Red Ensign which from our research, seems to have been in use fairly extensively. The evidence is as follows. 1. The Killie Campbell Red Ensign whilst itself obviously being a home made job, is indicative of its existence elsewhere. 2. The Natal Technical College in Pietermaritzburg had a Natal Red Ensign which was flown each year on graduation day and possibly on other special occasions. This was properly manufactured and proportioned and had the Captain Hine Coat of Arms but with a much simplified colour scheme i.e. black on khaki. The Principal of the College claimed that the flag was an original relic from pre-Union days. Two other examples existed-one was displayed in the entrance hall of the old Natal Assembly Building and one was displayed in the Durban History Museum. The latter was a reproduction produced by another Durban Manufacturer. It is possible that the Tech example was also a reproduction, but even if it was, it again begs the question - reproduced from what example? 3.The Harbour master or Port Captain flew a Natal ensign pre-Union, which considering its Maritime/Civilian locality, was almost certainly a Red Ensign. 4.Several monochrome photos exist of the ensign pre-Union. One particular photograph taken on the Durban beachfront circa 1905 shows a display of two governors flags and two Ensigns. Whilst obviously one can not be certain whether the Ensigns are red or blue ,they appear lighter than the Union Jack blue in the rest of the flag and on a balance of probabilities, are thus likely to be Red Ensigns. When one considers that there are no relic Natal Blue Ensigns (apart from, as far as I am aware, the Royal Natal Yacht Club Ensign) all the evidence points to a Natal Red Ensign ' a la Canada'. Also Captain Hines Wildebeest were in retreat. This was corrected by the York Heralds in 1904/5. The modern Natal Arms had them in full charge towards the enemy! 'Within a gold Chippendale-type frame, in front of mountains and on a plain two Wildebeest contourne' in full course, side by side, proper, there beneath the name NATAL in black letters, the frame ensigned of a Royal Crown, also proper'. Note there is a black circle around the badge in the centre on this occasion. Otherwise the Governor of Natal's flag followed the usual pattern used in the British Colonies, and placed the badge within laurel Garland on the Union Flag. There is a Flag of the Governor of Natal (colonial flag) at eBay. For image click here. 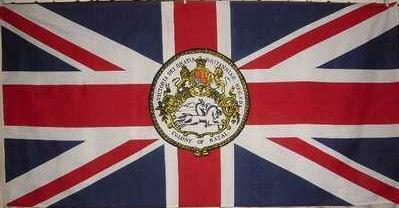 Union flag with complex Victorian badge: 'Within a Chippendale-type frame, on a plain, two Wildebeest (gnus) in full course at random with the words COLONY OF NATAL beneath the frame. The frame itself is ensigned with the Royal Arms, and around the circumference appears the legend VICTORIA DEI GRATIA BRITANNIA REG. F.D.' Flag measures approx. 6' x 3' (1.8 m x 0.9m). This replica was made ca. 1995. I remember seeing many stickers on the back windows of cars in 1990. These stickers were split vertically showing the Union Flag on the left, and the badge of the Colony of Natal to the right on a *red* field with the words "The last outpost". I stand to be corrected here, but I seem to remember that the badge used was the second badge as described below . This of course is most certainly not official, and could have been the result of "Artistic license" . Natal is often referred to (light-heartedly), here in South Africa, as "The last outpost of the British Empire" and the police force in Durban are *officially" called "The Durban Metropolitan Police" as opposed to the "South African Police"
'Within a gold Chippendale-type frame, in front of mountains and on a plain two Wildebeest contourne' in full course, side by side, proper, therebeneath the name NATAL in black letters, the frame ensigned of a Royal Crown, also proper'. This simplified device thus predates the grant of Arms to Natal on 16 May 1907. A "simplified" version of the Natal Blue Ensign thus replaced the earlier version containing the full Colonial Seal in the fly. According to Brownell in "The Union Jack over Southern and Central Africa, 1975-1994" [brl94] there does not appear to have been a Red Ensign version of this flag.